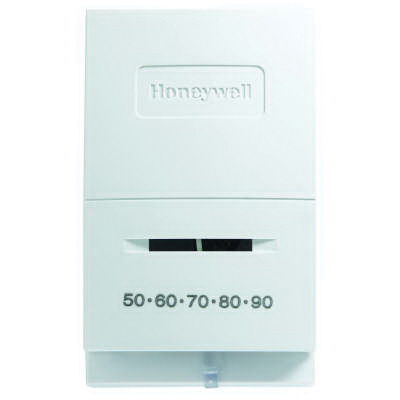 Honeywell Low volt non-programmable thermostat with one heat stage, features integrated thermometer and setting scale. It has voltage rating from 20 to 30-Volts AC, current rating from 0.02 to 1-Amp and power rating from 0.4 to 30-Watts. It provides vented cover for improved temperature sensing. The mercury-free thermostat has precision snap action switching with SPST switching action. The thermostat with bimetal sensor, is suitable for heat only.